Wearing the perfect dress on your wedding day may be something you’ve been dreaming about for a lifetime. We are so pleased to be a part of your magical day and want to make certain that shopping for THE dress is a fantastic experience. Our enthusiastic and knowledgeable staff will help you find that perfect dress; one that complements your figure with a style that reflects your personality. •So that we can provide the best service and our dedicated attention to you, our bridal consultants are available only by appointment. •After you find your wedding dress, your consultant can help you find the perfect veil and accessories to complete your look. •Bridal appointments are 90 minutes. •We welcome your guests! There is seating for three guests. For a those with a larger support system and/or entourage, please call ahead and we will do our best to accommodate your needs. •All of our dresses are special ordered for each bride. Everything is sample size (plus sizes included) and sample color. •Celebrate completing this wedding milestone with a champagne toast, on us! What’s better than getting your best friends together to try on beautiful designer dresses? We can hardly think of anything more fun. So round up the group and make an appointment to see our selection! Our bridesmaids specialists will take great care of your bridal party while keeping your order on track and organized. •So that we can provide the best service and our dedicated attention to you, our bridesmaids consultants are available only by appointment. •We recommend that you limit bridesmaid appointments to three guests. If there are more in your party, please call ahead and we will do our very best to accommodate your group. •Every bridesmaid’s dress at d’Anelli is sample size and sample color. Color swatches are available. •There is a $25 try-on fee for dresses ordered elsewhere. Try on appointments include measurements by a bridal professional. 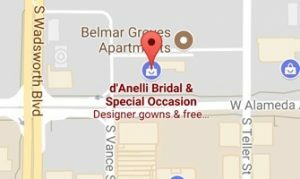 •For brides who purchase a d’Anelli wedding dress, a 10% discount applies for each bridesmaid’s dress ordered. •Out of town bridesmaids? Not a problem! Simply complete our out-of-town form. Bridesmaids, please note: our platforms and stages are reserved for brides. All-over sparkles to over-the-top bling, or simple flowing silk. From elegantly modest to tastefully risqué. We have your perfect prom or pageant dress. Carefully hand-selected by the whole d’Anelli team, our inventory showcases the most unique, gorgeous, designer dresses for all body types. Our team is committed and excited to help you find the perfect dress for your occasion. •Prom appointments are highly recommended. •Everything in our store is sample size and sample color. Color swatches are available. Plus size samples are also available. •Most dresses arrive 2-4 weeks after you order. •As part of our special occasion service, we register each dress to your high school, ensuring your unique look. Special occasion customers, please note; our platforms and stages are reserved for brides. •All alterations visits are by appointment only. •Call to book your free 30 minute consultation. •We suggest scheduling your first alterations appointment at least 12 weeks before the date of your wedding. You are welcome to make your appointment earlier if your schedule allows. •For Bridesmaids, Mother-of-the Bride/Groom, and Evening/Special Occasion garments, we suggest scheduling your first appointment 6-8 weeks before pickup. Alterations of these garments typically require two 30 minute appointments. •For rush situations, please call, and we will try to accommodate your schedule. •Alterations of garments purchased elsewhere are most welcome. Pressing: We offer discounted pressing for all special order garments that have alterations completed through us. For garments purchased but not altered with us or garments purchased elsewhere, pressing is full priced. All pressing is done on-site by professionals. Please allow 1-2 weeks for this service, with a scheduled pick-up date. Please call for pricing and to schedule. Drycleaning: We work with a commercial Colorado wedding dress dry cleaner that is second to none. As with all dry cleaners, they cannot guarantee any spots or stains will come out completely, but they make every effort and do an amazing job. Please allow for 2-3 weeks for this service, with a scheduled pick-up date. Please call for pricing and to schedule. Wedding Dress Preservation: We offer wedding dress preservation services after the wedding date. We are an elite dealer with Wedding Gown Preservation Company, a professional company that has been trusted since 1913. Please allow for 10-14 weeks for this service. Please call for pricing, price includes shipping directly back to you.